This year, 2018, is the year that Aja Fatou Bah school comes into itself, to serve the Brufut community and become a model educational institution for all of The Gambia. Thanks are due to our sponsors, our staff, and the local parents who continue to support us in our work; we could not do it without you. The big news for the new year is that free school meals are now being served on a daily basis to all of our nursery students. Fresh healthy and nutritious lunches are being served to our students, thanks in large part to the support from the Barking Al Madinah mosque in London. 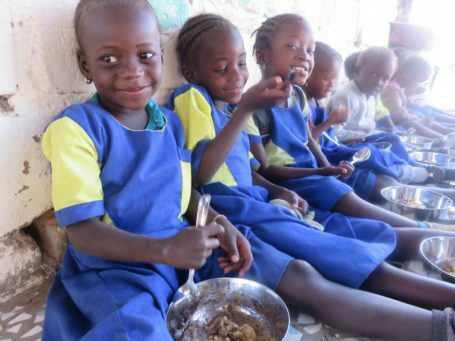 A Gambian proverb states: Sacu nen du taxaw, “An empty bad cannot stand;” and so we believe that feeding the bodies of our students is part of our job to help them grow into strong independent and critically minded citizens. Our adult literacy class for the local mothers is expanding to include skills and activities such as sewing, embroidery, and computers. The school is now open to them in the evenings as a safe space, and topics such as nutrition, citizen’s rights, womens’ health are incorporated into the reading materials. The school grounds continue to be beautified through permaculture: local Bahama grass, palm trees, Bougainvillea flowers, and avocado trees have been planted, walkways and paving slabs laid, the playground developed… The school now looks as cool as it feels, and we have the students smiles to prove it. We had the good fortune to be visited by Dr Andrew Newton from the UK in January. Andrew gave dental hygiene training to all of our students, as well as giving each child a toothbrush and donations of clothing. For our staff, Dr Newton gave first aid training and donated relevant materials to the school. Thank you Andrew and team for your time and efforts! With this great start to the year things can only get better for the Aja Faou Bah school. We continue to strengthen our curriculum, whether through play, art, permaculture, technology, theatre, language and literature. We believe the sky is the limit and that education is the best gift we can give to the world.